Article first published as TV Review: ATYPICAL on Seat42F. 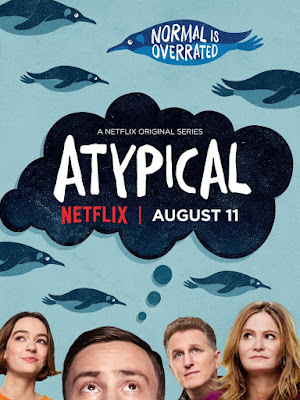 I hesitate to peg Netflix’s new series, ATYPICAL, as either a drama or a comedy. Yes, that’s true of a lot of shows these days, especially on premium cable or streaming services, but I feel like this one’s a bit harder than most. Pressed, I guess I’d say it’s a comedy based mainly on the running time, which clocks in at under forty minutes per episode. But it’s a very serious topic being delved into, and the level of discomfort in many of the characters keep this from being too funny. At the center of ATYPICAL is a family of four, the Gardners. Sam (Keir Gilchrist, United States of Tara) is an eighteen-year old high school student with autism. His sister, Casey (Brigette Lundy-Paine, Irrational Man), looks out for her brother, and mostly ignores boys while she concentrates on her studies. Mother Elsa (Jennifer Jason Leigh, Weeds, The Hateful Eight) is unhappy in her marriage and considering an affair, while father Doug (Michael Rapaport, Justified) never figured out how to connect with Sam the way he does with Casey, though he loves both of his children. Yes, this is a pretty typical family unit, and with some slight tweaks, could be a typical sitcom. What raises it above that is the cast, which is outstanding. Aside from Lundy-Paine, who is relatively new, the actors have a lot of experience, and including Lundy-Paine, a lot of talent. The clan feels very authentic, with complex, nuanced emotional feelings towards one another. And yes, Sam’s autism is a big part of the show. How can it not be? It not only affects his life, but the lives of those around him, especially now that he wants to start dating. But it’s not the be-all, end-all of the show. There are other things going on, and even without the autism, this show could still exist (though it might have been a harder sell to Netflix). Other series have started to put autism on screen lately; Parenthood springing to mind. I feel like it’s something not everyone understands right now, and getting to see portrayals of it on television is important. Familiarity breeds acceptance. While some may discount television’s influence on the culture, and while hatred does still exist, I feel credit is due to the small screen for helping ease racial and sexual tensions over the years. Autism doesn’t evoke the same strong negative reactions, usually, but it certainly can’t hurt for people to understand people with it a little better, whether you think it’s a disability or not. The supporting cast is delightful. Amy Okuda (The Guild) plays Julia, Sam’s therapist, which I already see an obstacle coming from after episode one. Graham Rogers (Quantico) is Evan, a love interest for Casey. Nik Dodani is Zahid, Sam’s best friend. Raul Castillo (Looking) serves as a temptation for Elsa, hopefully one she won’t give in to. I have seen reviews for ATYPICAL that range from praising it for being the best Netflix show ever, to those who find it offensive or trite. Thankfully, most are positive, and while I wouldn’t go so far as that first reviewer I mentioned, I would say it’s a solid addition to the service’s lineup. It’s fresh, surprising for a series that looks pretty standard on paper, and as mentioned, the cast is excellent. The direction and production value are good, and I became emotionally invested very quickly when watching the pilot. There is a healthy dose of realism without being gimmicky or gritty, and it has good balance for its leads and themes. I have no problem recommending this one. All eight episode of season one of ATYPICAL are available now.